WASHINGTON/CAIRO: Egyptian women who fought alongside men for the resignation of former president Hosni Mubarak are now fighting for equality. During the 18-day Egyptian uprising, help from women protesters was welcomed by men, despite women’s traditional roles being limited to the private sphere of the home. But now that the revolution is over, men are forcing women out of the public sphere and telling them to stay home, a panel of specialists and activists said yesterday. “Men said ‘Your time is not now. We are focusing on democracy first and then we’ll get to you,’” Ziada said. Hassan said women protesters are not calling for women’s rights alone. They are also advocating for better health care and education – “the same things men are fighting for”. Egyptian women activists are eyeing the parliamentary elections in September as another opportunity to increase their public role. The avenue to a greater voice for women opened in February 2010, when Parliament officially reinstated the women’s quota system, which designated 64 of 508 seats for women. However, the panellists said there’s some disagreement among women about quotas. Some activists argue that removing quotas would allow candidates to be elected based on their qualifications alone, rather than gender, and would not limit how many women can earn a position. Others say that the quota is necessary to getting women’s foot in the public door. Regardless of how women become involved in Parliament, there was unity behind their message: “We don’t have to be silent anymore,” Amany El-Tunsey, Egyptian publisher, author and activist, said. “The revolution broke the barrier field, not just between government and protesters but between government and women who want to voice their opinions,” Hassan said. Bringing more women into Parliament would not only provide the female population with a voice on major decisions, but it would also bring the “dignity and respect that (women) have been waiting for,” Hassan said. Since the revolution, Hassan said the long-standing problem of sexual harassment has not only resumed but it has “run rampant”. Women are subjected to both verbal harassment and groping every day on the streets, much like that sustained by CBS correspondent Lara Logan, who was brutally beaten and sexually assaulted by a group of men the day Mubarak resigned. “We’re transgressing back to everything we’ve tried to overcome,” Hassan said. Hassan and a group of women activists have organised a Twitter campaign to confront the harassment. Activists across the globe are asked on June 20 to tweet and blog about abolishing sexual harassment. 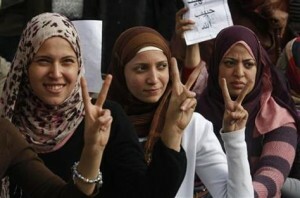 via After Mubarak activism, Egyptian women battle for equality | Free Malaysia Today.